Dave Anderson is the Founder, CEO and President of Syte Logix. As a healthcare analytics and security executive, he brings his extensive experience in data analytics, cyber-security, risk management, patient privacy, and connectivity to the growing challenges of the MedTech and clinical data management market. His analytic and data exploration models create new opportunities for customers and partners to significantly improve the ROI around clinical research, and get products to market in a faster and more secure manner. Background: Clinical trials in cystic fibrosis (CF) patients might include post-B2 agonist bronchodilator (e.g. Salbutamol) evaluation of pulmonary functions. Sinus and SVT tachycardia have known dose-related side effects of inhaled salbutamol. A relationship between inhaled beta 2 agonists and increased risk of myocardial ischemia (MI) and infarction has been reported. Under normal breathing conditions, CF patients might show mild tachycardia compared to healthy subjects. Nevertheless, the impact of B2 agonists on the CF- associated tachycardia is often an ignored safety parameter in CF clinical trials. Here, we demonstrate a case of post-salbutamol clinically significant tachycardia associated with ECG features of MI in a CF patient. Case Report: A 21 year old CF female patient has been included in a clinical trial evaluating a new medication for the treatment of CF. Medical history, physical examination, vital signs and laboratory investigations showed no clinically relevant findings. 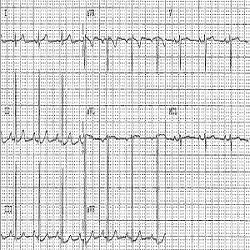 A 12- leads ECG recording showed a sinus rhythm with a heart rate (HR) of 90 bpm. An inhalation dose of 400ug salbutamol has been administered to perform post bronchodilator (PBD) pulmonary function tests and collect spontaneously expectorated sputum. The patient’s cardiac electrical activity was monitored (by means of telemetry) before (baseline, BL) and after salbutamol administration. A pre-bronchodilator (Pre-BD) telemetric recording showed episodes of asymptomatic tachycardia with fluctuating resting heart rate between 79 to 117 bpm, without ECG signs of myocardial ischemia. At 45-60 minutes after salbutamol administration, the telemetric recordings showed sinus tachycardia with resting HR fluctuating between 97 to 141 bpm and ECG manifestation of tachycardia-induced myocardial ischemia (Figures 1 and 2). 3 to 4 hours post salbutamol the HR returned to BL, and the patient has been discharged after ensuring her safety. Thyroid function tests have been performed to verify the aetiology of the tachycardia. These demonstrated normal results. Re-challenge tests have been performed on other visit. These confirmed the salbutamol associated cardiac effect. Discussion & Conclusion: B2 agonist should be administered with caution to tachycardic CF patients. This may imply salbutamol dose adjustment and requires monitoring with cardiac telemetry. This might avoid unwanted cardiovascular adverse effects such as MI. This line of reasoning is substantiated by the increased likelihood of CF- associated cardiac CFTR chloride channel abnormality that results in deficient CFTR- induced cardiac ischaemic preconditioning and therefore increase the risk for ischemic heart disease in CF patients, particularly in the older age group with pre-existing decreased cardiac reserve.